It isn’t always easy to be an understanding human being, especially when people don’t do what you expect them to do. This can be so frustrating and I totally understand. Of course, people with different opinions and new ways of doing things can be irritating at first but what if being curious and having great conversations could help you bring new solutions to old problems? Diversity in our organizations is key but the understanding isn’t always there. We make assumptions, take things personally and sometimes we aren’t patient enough to explore where the other person is coming from. Things are not always as they seem and we have to learn to be more considerate. “The man doesn’t know that there is a snake underneath. 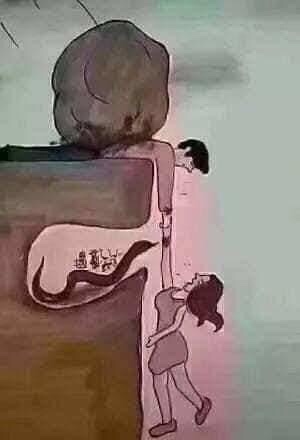 The woman doesn’t know that there is a stone crushing the man. The moral is: You can’t see the pressure the other person is under, and the other person can’t see pain that you’re in. This is life, no matter whether it’s with work, family, feelings or friends we should try to understand each other. Learn to think differently, consider a different perspective and communicate better. I hope this story made you think. It is true, we don’t always know what people are going through.